A big part of being a trainer is education. Lots of education. For as much time as I’m driving to people’s houses or teaching in class I’m also watching seminars, webinars, reading books, and attending conferences. Every once in awhile I stumble upon a particularly interesting article or book that I just have to discuss with you guys. Lately I’ve been getting a lot of “aggression” cases. It seems that one out of every five calls I get is from a distraught owner that’s been chewed out by some vigilante at the park or is stressed beyond reason about having to walk around the block for fear of an outburst from his or her dog. I found myself thinking, “what exactly is going on here? Are the majority of dogs in the city of Toronto all savage beasts or is there something we’re not seeing?”. Then I happened to watch a webinar by Dog Trainer extraodinare Pat Miller called “Reality Bites: Safe, Effective Dog Aggression Modification”. Within the first five minutes she addresses my exact feelings. She outlines what she thinks are the main reasons that it seems that, yes, there are indeed more aggressive dogs than there used to be. Not all aggression is bad. Not all aggression needs to be “trained out”. 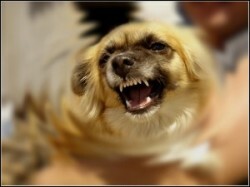 In fact, many types of aggression in the dog world are a normal and natural part of social interaction. In the training world we call it “Ritualized Aggression”. It’s the canine equivalent of a screaming match in line at the grocery store. It might SEEM like you and that rude guy that cut in line want to kill each other, but in fact, you’re just trying to express a point. Nobody has any plans to pull a knife. At least not unless something is very wrong with one of you. Even we, as humans, are allowed SOME level of appropriate expression of our anger. We’ve denied that to our dogs. We expect them to be ok with every person, every dog, and every situation no matter how tired, stressed, anxious or overwhelmed they are. We don’t care about their preferences or their personalities. Then we wonder why our shy, timid dog ends up in a fight when we throw him in a crowded dog daycare to get him better “socialized”. This one is going to earn me some angry comments, but don’t shoot the messenger. I’m simply outlining Pat Miller’s views on the subject:) Again, she’s coming from an American point of view, but from what I’ve seen (my shelter friends can help me out here), it’s not much different in Canada. Whether it’s a good or bad thing, it’s a fact. Because shelters are much less likely to euthanize dogs with serious aggression they’re being forced to try to place these dogs for adoption. As a result, dogs that would have never been put in a home are finding their way into communities and dog parks because there’s no other choice. The average owner is in over his head with most of these cases and a weekly visit with a trainer (even a good one) isn’t going to “cure” these dogs. They take a lifetime of strict management and Counterconditioning. One slip-up and that poor owner ends up as the next news headline with yet another “Aggressive Dog“. A truly good breeder will breed for temperament as well as appearance. Ideal companion dogs are confident, sociable and tolerant. A good breeder spends time with each puppy, getting to know its personality and can therefore place it in a home where it will be best suited. A puppy mill doesn’t care even a little bit about any of those things. They’re just trying to produce the largest number of puppies in the least amount of time. What you’re left with is a whole lot of puppies with questionable temperaments that grow into dogs with full-on behaviour problems. Thank goodness that in 2005 Ontario made Amendments to the Ontario Society for the Prevention of Cruelty to Animals Act that addresses Puppy Mills. Ontario is the first to enact laws that force mill operators to pay a fine of up to 50,000.00 if convicted. Read here for more info. Let’s hope this is just the beginning…backyard breeders are a whole other can of worms. If you’re thinking about buying a puppy then please, I beg you, do your research first. There are plenty of amazing breeds out there-not all of them will be happy in your home. Just because you think an Akita looks like a giant teddy bear doesn’t mean it wants to be cuddled. Certain breeds, like herding breeds for instance, are programmed to use their mouths and to chase things around-not ideal for a family with three kids. Unless you are a competitor or you’re prepared to exercise your dog until he can’t stand, don’t look for a working dog. He’ll be under-stimulated and that can lead to boredom and boredom can lead to behaviour problems. Call a trainer that can refer you to a breeder…you’ll be much happier for it and there will be fewer dogs in the shelter in the long run. This is a double-edged sword. On the one hand, people are starting to believe in the power of a good dog trainer. And so they should. On the other hand, this has led people to think that any problem can be “fixed”. This, ironically, makes us less tolerant of normal, natural dog behaviour. Part of the challenge is to understand that not all problems need to be fixed, nor can they be. I’m sure my colleagues will agree that the majority of our job is about managing our clients’ expectations. While we can get you a long way toward having the relationship you’ve always wanted with your dog, we certainly can’t work miracles. There has to be some level of understanding that, in the end, dogs will be dogs.